Welcome to the Download Center, where you can download certificates, info sheets, training materials, whitepapers and more. For product data or Declarations of Compliance, please visit the relevant product page, or collect a group of products in a Product List, and perform a bulk download. If you need additional marketing materials or documentation from a recent site survey, you will need to log in first. To do so, click the icon. WhitePaper - Metal detectable plastics use in cleaning tools - does it reduce foreign body risk? Article - Are your cleaning tools food safe? EU food-contact compliant Nylon Scraper in 5 colours! The Vikan logo is carefully designed and must not be changed in any way. The relative dimensions of the logo elements must always be kept. The logo must not be copied or imitated, as it is a registered trademark. 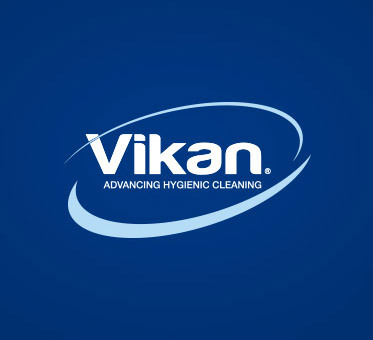 The tagline - Advancing Hygienic Cleaning - is an integrated part of the Vikan logo. The tagline should always appear with the logo. Except in cases where the logo width is smaller than 35 mm. On this page we give you the possibility to download our logo in jpg and eps formats. Jpg format is usable for most purposes. Eps format is primarily for graphic use when a very large logo is needed.